The fabulous flavour combo of APPLES, sweet MAPLE and ANIS aromas dancing through our home was unbearably teasing us with impatient anticipation. NO electric mixer required.
. Pre-heat regular oven to 350F/180C/Gas4. Place the rack on second shelf from oven bottom. Oil a 10 inch (25cm) spring form cake pan and place onto a baking sheet pan. Set aside.
. In a large bowl...whisk the Sambuca liquor with the orange concentrate and sugar. Set aside.
. Peel and core one apple at the time and add the medium thin slices to the bowl with the orange Sambuca liquid. Always toss and coat the apples as you go along. Repeat with the remaining apples. Cover the bowl and set aside as they macerate.
. In a medium bowl, prepare to sift the following dry ingredients: flour, baking powder, sea salt, sugar and nutmeg or ground cinnamon. Now, make a well in the center. Add into the flour mix the following: eggs, oil, and the remaining Sambuca liquor. Give everthing a good whisk until smooth. Do not over mix. Pour the batter into the greased cake pan. Slightly shake and tap down the pan so that the batter spreads properly.
. APPLES to be ADDED: Start with placing 1/3 of the apple slices. Push them down the whole perimeter of the pan. Afterwards, throughout the center, tightly nestle another 1/3 of the apples. Push them down as well. 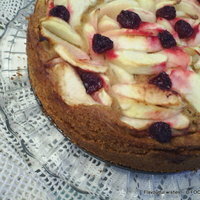 The last 1/3 of the apple slices will serve to tidy up and decorate the rest of the cake. Finish off the top by garnishing with the fresh (or thawed) cranberries. Sprinkle the top with some granulated sugar (optional).
. BAKE for 80-90 minutes depending on the darkness of your cake pan. Once out of the oven, leave it cool 10 minutes before unclipping the pan. Cool the cake to room temperature before serving. Enjoy. Wow, I've used Sambuca in a Chocolate Sambuca biscotti but never would have thought of it for an apple cake. This really sounds like an interesting combination of flavors. Patricia...any chance that the chocolate biscotti recipe will make it on your blog any time soon?